The copier dudes are going to love this one. 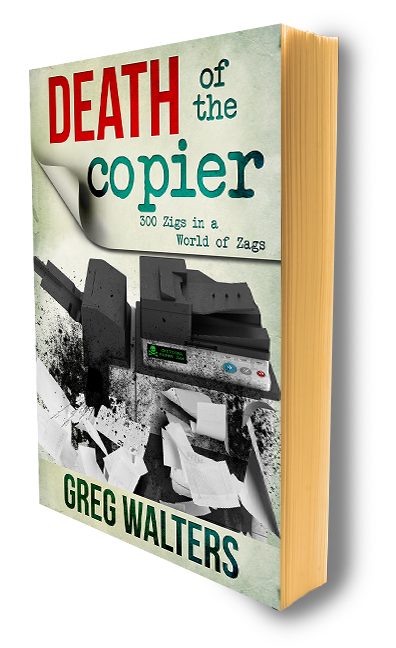 Why don't we get residuals on the traditional, Cost Per Copy, service agreements for copiers? If an MPS rep gets a cut of the volume, why shouldn't a straight copier rep get residuals on the service agreements? And by 'copiers' I mean standalone or connected, copiers, printers, fax, MFPs, MFDs or whatever the heck else you call them. Are you selling Konica Minolta copiers? Ricoh's for an independent? Canon? Or how about all my peeps @ RiKON? How easy is it to sell a straight machine, WITHOUT a service agreement? Why haven't we ever compensated the rep on the number if copies/images produced on the copiers they sell? Ever wonder why you haven't been paid on service agreements? No wonder the copier guys are killing MPS. From the beginning, dealerships were effectively selling hardware at a loss. Overhead, G&A, cost of sales, etc. can not be supported by hardware GP alone - this is why the service revenue is sacred. Not only is this revenue repeatable and predictable, the organization's real profits are driven by service contracts. I know, I know. That was the deal when you signed up to sell. Yadee, yadee.. I don't think anyone believes we can sell MPS and NOT be compensated for pages/volume. MPS is not an equipment focused sales motion, although equipment is part of the equation. "Blended" usually refers to b/w & color images spread over a fleet of cartridge based MFP's. So why can't blended include cartridge based AND bottle centric devices? Because then we would need to pay "copier reps" the same as MPS Reps. So to me, this is sign of how committed one is to MPS - does your organization pay residuals on ALL device service agreements? If so, great. If not - I double, dog dare you to go ask why not. After all the racy pictures seen in your post, you have the nerve to post an edited down version of the video? I am utterly shocked. Yes - I nearly did not use because it is watered down and ball-less. The sound and video quality are superb - so I put it up. Seems the record company didn't want the real version playing. I am sure there is a non-neutered copy out there somewhere, but if I can't find it in less then seven minutes, I move on. Great Observation! Keep coming back.